The leaves’ lovely double shade - a dark green face contrasted with a light green back, cover the arm and length of the tree. 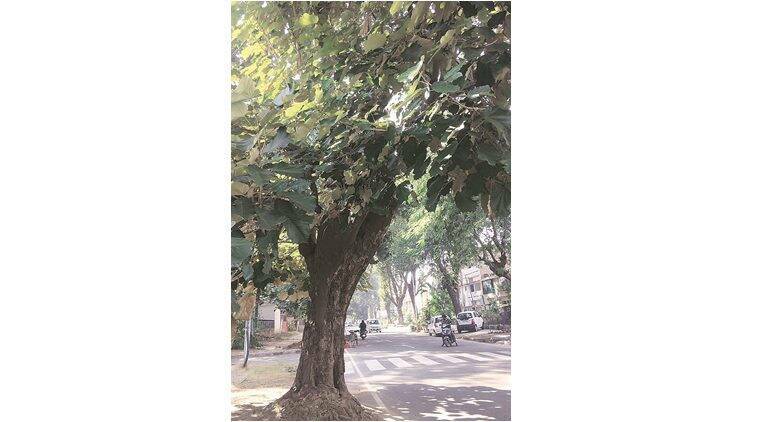 AS soon as you take a left turn towards the residential area around the corner of Batra Theatre in Sector 37, you will pass by a line of pretty tall and large trees, rooted on both sides of the winding V5 road with their massive leaves providing a dense cover. The leaves’ lovely double shade – a dark green face contrasted with a light green back, cover the arm and length of the tree. Those residing in Sector 37 are also privy to the beautiful white flowers that bloom and fill the air with their aroma from March to May. In the botanical world, the tree has a scientific title that’s rather tough on the tongue — Pterospermum acerifolium. But for us lovers of the tree world, this majestic piece of nature’s true character is reflected in its regional name – the Kanak Champa. Also known as the Maple-leaved Bayur tree and Muchkund, the Kanak Champa belongs to Sterculiaceae (Sterculia family). Native to the foot of the Himalayas, Sikkim, Khasi Hills, Manipur, Burma and Java, the tree is usually cultivated as an ornamental tree and finds extensive use in landscaping. It’s the flowers and leaves of this tree that are the most useful part when it comes to health benefits. Kanak Champa finds use in Ayurveda, where its flowers and leaves are used in treating headaches, ulcers, wounds, coughs, colds, bleeding disorders, etc. While the flowers are rubbed into a paste to treat hemicrania or headaches and also kept among clothes for their perfume and as insect repellants, the leaves treat wounds and itches. However, the most interesting benefit of the leaves are that they double as ‘dinner plates’. That’s right – owing to their rather large and decent size, the leaves are woven into dinner plates and hence the tree in some of parts of India has earned the nickname ‘Dinner Plate Tree’. The mature leaves can reach a length and width up to 35 cm, and so find lots of use during serving food, or as packaging and storage material. From serving as an ancient material to reinforce roofs and prevent leaks, to a surface for drying tobacco (in Burma), to even serving as kindling for fire, the leaves are versatile. Meanwhile, the wood, which is rather durable and flexible, makes for the right material for planks and wooden boxes. As for the bark, it helps in cases of scabies and interestingly, in topical preparation of lipsticks. Come March, the tree will be resplendent with big white, finger shaped flowers that look like open banana peels. They emit an attractive fragrance, attracting moths for pollination. Because the fruit can take up to almost a year to mature, the Kanak Champa of Bayur tree lags behind the faster-growing trees and hence is not widely distributed. The fruit capsule, when split open, releases a large number of ‘winged seeds’. That’s where the scientific name comes from — Pterospermum is based on two Greek words, Pteron and Sperma, meaning “winged seed” while acerifolium indicates leaves shaped like a maple’s. In Chandigarh, you can spot the tree in Sectors 4, 14, 37 and in PGI.